Slow moving food: This is me again, informing you about the assault slow-foodies are making on fast-foodies. They’re staging the Slow Food First Coast Tour de Farm this Sunday, April 22, from noon to 5 pm. In Jaxonpool’s environs, 20 family-owned farms will host tours or workshops for the public. The local food movement has united for Coughing Planet Day. The only way fast-foodies can fight back is to distract the public with a decoy: the Slow Moving Food Tour de McDonald’s. The Slow Moving Food Tour de McDonald’s also will take placethis Sunday from noon to 5 pm. 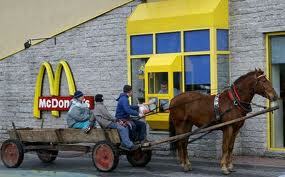 We will return to Good Ole Fashion country values by using horse-drawn carts to tour Jaxonpool’s ten McDonald’s locations. (Only ten?) By the time it will take for a cart or buggy to travel from one franchise outlet to another, the occupants will have consumed the milkshakes, fries, and Double Quarter Pounders with Cheese they purchased at the last one and will have built up hearty appetites for another meal. In fact, most of the outlets are spaced far enough apart that everyone in the cart or buggy should be famished by the time they pull up to the next McDonald’s window. Because virtuous eaters are scarce as liberals in Jaxonpool, the average Jaxonpudlian will find the Tour de McDonald’s far more compelling than the Tour de Farm. Just reading about the Tour de Farm and Slow Food First Coast makes me want to chow down on an Angus Bacon & Cheese. According to Leslie Kaplan, a promoter for the rival Tour de Farm who this morning was a guest on “First Coast Connect” hosted by Melissa Ross, some of the family-owned farms taking part—Cognito, Down to Earth, Navara, Twinn Bridges—will have a chef or other artisan partner either making lunch or offering samples. Some even will have wine for adults. Fresh produce will be for sale. Southwest of St. Augustine at Black Hog Farm, the family farmers will be hosting Joel Salatin, the anti-fast-food zealot featured in the 2008 Robert Kenner propaganda film, Food, Inc., and in Michael Pollan’s 2006 book, The Omnivore’s Dilemma. The the local food movement unites slow foodies, gourmet eaters, social activists, environmentalists with hunters, people gardening because it’s cheap, people who want the right to do what they want on their land, people who care about small businesses . . . If you haven’t gotten enough yet of this tripe, go here! Carrots fresh from the fields! My God! Wouldn’t you rather see crop dusters spraying pesticides on an enormous field? Hear, taste, and smell the inside of a Tyson poultry plant? Hear and smell the bodily waste from a massive hog raising operation being channeled into a retention pond? Fast foodies, unit! We are the ones who own the future, not these wierdo slow foodies. We will not be outdone! To prove we’re more progressive, let’s get our buggies out! Great! Glad to have you along for the ride!